Trupti Khamkar, who started her career with theatre and rose to fame with webseries and stand up comedy, will be seen as lady cab driver of Vidya Balan in Tumhari Sulu. 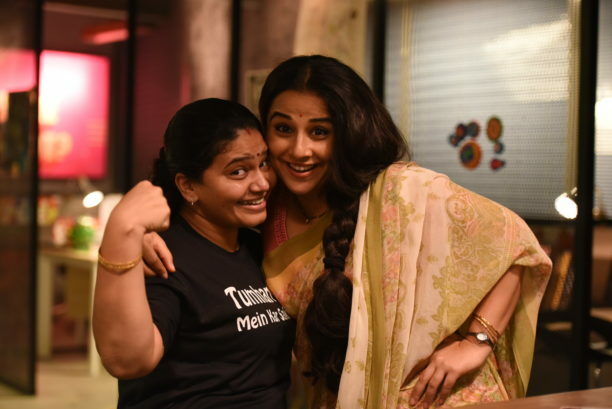 When they went to shoot the scene, Trupti actually stalled Vidya Balan’s shot for 10 mins while shooting for Tumhari Sulu. The actress had to shout aloud for a scene which cracked up Vidya so muc that she couldn’t stop laughing and they have to stop shooting for her to calm down. Trupti Khamkar is the only actress, who has performed play in three different languages in Shakespeare Globe in London and has also been part of TVF’s Humourously Yours and Bisht Please. Tumhari Sulu hits theaters on November 17th!